On Sunday, June 10, The Amity Booster Club hosted the annual Block A Dinner at Race Brook Country Club. The event honors the best of the best of all the Athletes at Amity High School. 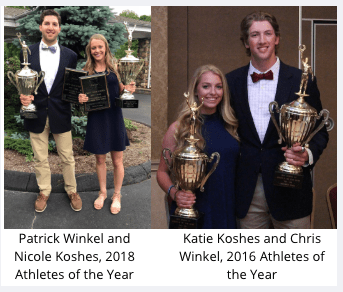 Top honors (Athlete of the Year), as we posted the other day, went to Patrick Winkel and Nicole Koshes. One of the other highest awards (Scholar Athlete) went to one boy and one girl who are not only excellent on the field, court, links, track, whatever but also excel in the classroom. This year, the male scholar-athlete Jacob Silliman was an Amity Ice Hockey defenseman. He has an astounding 4.9 GPA. The female scholar-athlete Shayna Goldblatt, a tiny, physically fit young lady who surprised the wrestling coach when she expressed her desire to join the team a couple of years ago. With sports trainer Kim Pierce’s encouragement, Shayna learned everything she needed to know and this year, she was one of the co-captains. She also played field hockey, contributing a lot to that team and as an underclassman, she was on the outdoor track team. No matter what she takes on, Shayna always gives her all. She obviously takes her studies seriously and is a fantastic choice for this year’s scholar athlete award. As Yogi Berra once said, “It’s déjà vu all over again.” At least that’s what it felt like for me. I don’t know if anyone else realized it, but it immediately struck me when the Athlete of the Year winners were announced at the Block A dinner at Race Brook Country Club in Orange. Two years ago, at the annual Sports Dinner, Chris Winkel and Katie Koshes were crowned Amity’s Athletes of the Year. Go forward to Sunday, June 10, Patrick Winkel and Nicole Koshes were named the 2018 Athletes of the Year. So, there we go again. Two amazing Orange athletes with highly recognizable last names earning the top honor. This is quite a tribute to their parents, as this particular award is not only for the athlete’s playing ability but for the way they conduct themselves on and off the field. Congratulations Pat and Nicole, you both deserve this honor. Thank you for all you did for Amity over the years, all the best in College and in all your future endeavors. Every year the Amity Booster Club hosts the Block A Dinner (Athletic Awards) honoring individual Amity athletes for their exemplary work on – and off – the fields, courts and tracks – throughout the year. Perhaps the most coveted award is that of Athlete of the Year, it is the final presentation of the evening and the only one whose recipients are a closely guarded secret, known only to the Athletic Director and his administrative assistant. This year, two Orange residents, who honed their skills on the Orange Little League fields and became legendary on the Amity High School softball and baseball fields (and the Amity Basketball court), were named the male and female Athletes of the Year. It is our pleasure to announce that Katie Koshes and Chris Winkel are this year’s Top Amity Athletes. Both of them have proved their integrity, sportsmanship, talent and drive for the past four years and we are so happy that through all their success they remained humble and rejoiced in their fellow players’ accomplishments. Katie and Chris represent everything that the Athlete of the Year should be — Congratulations! 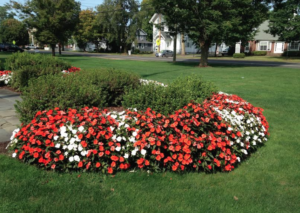 On June 14th the Amity Block A Dinner took place at Grassy Hill Country Club in Orange. The event honors the best of the best in Amity Athletics. Congratulations to all these fine athletes, we’ll miss you next year. The Amity Athletics Booster Club has been selling bricks that link current students and families to Amity’s future. Hundreds of alumni, friends and family members are currently represented on “The Wall” in the High School Cafeteria. Join them and include your message on “The Wall” today. Open to all grades, faculty, corporations, families, etc. The cost is $25/per brick. A 1.5” x 4.5” engraved brass plate with your inscription will be installed on the “The Wall” for everyone to view for years to come. Click on the Brick Wall Form below to purchase a brick to commemorate your student’s achievements at Amity. This makes a unique graduation gift. Seniors: During the Graduation rehearsal on Thursday June 18. Underclassmen: pick up Yearbooks on Thursday June 18 in main lobby between exams. Yearbooks are distributed at this late date to allow for inclusion of athletic awards given at the annual Block A dinner last Sunday, June 14. Books not picked up will be in the athletic office. 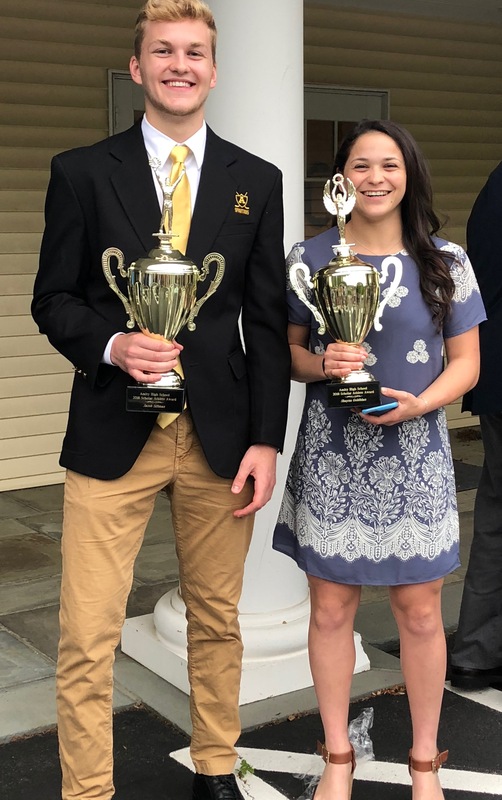 Sunday was a big night for Amity athletes at the 57th annual Block A Dinner and Athletic Award Presentations at Grassy Hill Country Club in Orange. Swimmer Dana Grindall and Track & Field star David Karabinos were named Athletes of the Year. Along with the student awards and scholarships, four new people were added to the Amity Alumni Athletic Hall of Fame. They are: Brad Chernovetz, class of ’93; William Ryan, class of 1983; Alison (Egnaczyk) Sammons, class of 1998 and Bob Orgovan in recognition of 40 years of support to the students and athletes of Amity High as a coach and faculty member.